Galileo Galilei by Domenico Tintoretto, 1605-1607. 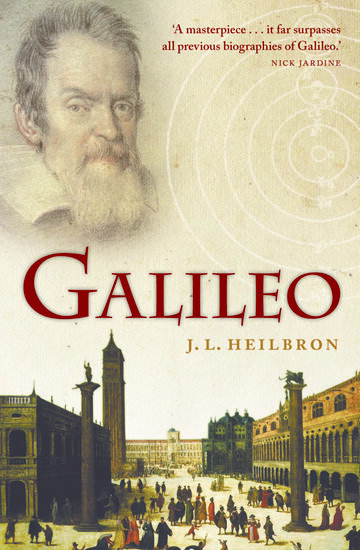 Galileo is not a fresh subject for a biography. Why then another? The character of the man, his discovery of new worlds, his fight with the Roman Catholic Church, and his scientific legacy have inspired many good books, thousands of articles, plays, pictures, exhibits, statues, a colossal tomb, and an entire museum. In all this, however, there was a chink. Galileo cultivated an interest in Italian literature. He commented on the poetry of Petrarch and Dante and imitated the burlesques of Berni and Ruzzante. His special favorite was Ariosto’s Orlando Furioso, which he prized for its balance of form, wit, and nonsense. His special dislike was Tasso’s Gerusalemme Liberata (The Liberation of Jerusalem), which violated his notions of heroic behavior and ordinary prosody. Galileo tried his hand at sonnets, sketched plots in the style of the Commedia dell’Arte, and delivered much of his science in dialogues. The literary side of Galileo is not a discovery; a large specialist literature is devoted to it. But there is a gap in scholarship between the literary Galileo and the rest of him. How were his choices in science and literature complementary and reinforcing? What might be learned from his pronounced literary preferences about the unusual and creative features of his physics? How does Galileo’s praise of Ariosto and criticism of Tasso, on the one hand, parallel his embrace of Archimedes and rejection of Aristotle on the other? Usually Galileo enters his biography already possessed of most of the convictions and concerns that prompted his discoveries and precipitated his troubles. One reason for endowing him with such precocity is that the documentation for his life before the age of 35 is relatively sparse. In contrast, a quantity of reliable information exists for his later life, after he had transformed a popular toy into an astronomical telescope and himself from a Venetian professor into a Florentine courtier (that happened in 1609/10 when he was 45). By paying attention to his early literary pursuits and associates, however, it is possible to tease out enough about his circumstances as a young man to give him a character different from the cantankerous star-gazer, abstract reasoner, and scientific martyr he became. A quarrelsome philosopher, half-professor and half-courtier, whose discoveries refashioned the heavens and whose provocative use of them brought him into hopeless conflict with authority, is an attractive subject for portraiture. Add Galileo’s life-long engagement with imaginative writing and the would-be portraitist has his or her hands full. But the resultant picture, even if well-executed, would be a caricature. Galileo initially made his living and gained his reputation as a mathematician. Leave out his mathematics and you may have a compelling character, but not Galileo. The mathematician and the littérateur have different ways of arguing. To fit together, one sometimes must give way. Galileo’s great polemical work, Dialogue on the two chief world systems, which misleadingly resembles a work of science, frequently privileges rhetoric over mathematics. When the scientific arguments are weakest, the two protagonists in the Dialogue who represent Galileo (his dead buddies Salviati and Sagredo) outdo one another in praising his contrivances and in twitting the third party to the discussions, the bumbling good-natured school philosopher Simplicio, for ignorance of geometry. The mathematical inventions of the Dialogue that Galileo’s creatures noisily rate as unsurpassed marvels are precisely those that have given commentators the greatest difficulty. These inventions are extremely clever but evidently flawed if taken to be true of the world in which we live. Commentators tend either to interpret the cleverness as shrewd anticipations of later science or to condemn the shortfalls as just plain errors. From my point of view, these marvels should be interpreted as literary devices, conundrums, extravaganzas, inventions too good not to be true in some world if not in ours. They are hints at the form, not the completed ingredients, of a mathematical physics. Galileo’s old Dialogue and today’s Physical Review belong to different genres. Unfortunately, just as the Dialogue was not intended to meet the requirements of accuracy and verisimilitude of modern science journals, so the journals don’t reward the sort of wit and style with which Galileo brought together his literary aspirations, polemical agenda, and scientific insights. John Heilbron is Professor of History and Vice Chancellor Emeritus of the University of California at Berkeley. One of the most distinguished historians of science, his books include Galileo, The Sun in the Church (a New York Times Notable Book) and The Oxford Companion to the History of Modern Science.